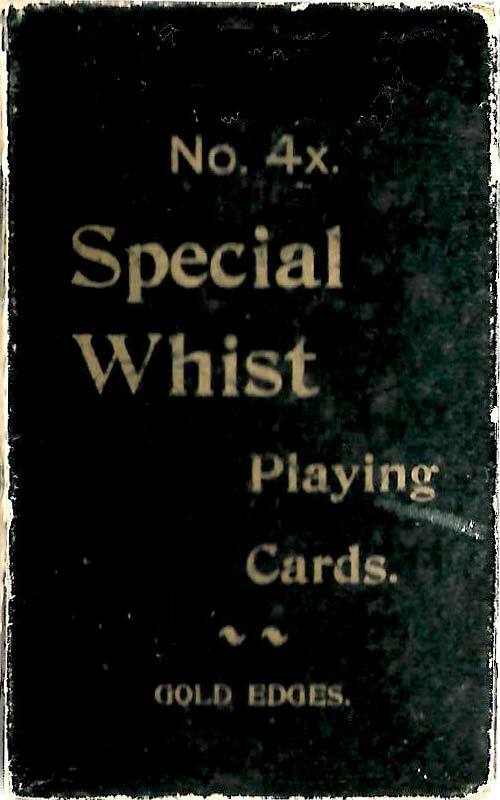 Above: No.4 Special Whist (American Skat) playing cards made by the Russell & Morgan Printing Company, 1889. 52 cards + joker. The rare joker is printed with light green ink and gives rise to a comical reaction from everyone who sees it. The ace of spades is nicely ornate and reads “American Skat U.S. Playing Cards”. The back design features the German eagle and the German and American flags intertwined. It was also used on the German suited decks, Skat No.1, Skat No.2 and Gaigel No. 4 all, no doubt, with the German Immigrants in mind. The telescope box is puzzling. At the time the deck was made and for quite sometime thereafter, the card company issued its decks in very attractive boxes. This deck is in a rather nondescript jet black box with gold lettering. Images and notes courtesy Rod Starling. Note: North American Skat is a trick-taking card game using a 32 card deck created from a standard deck stripped of all cards lower than 7.